Spent this morning enjoying our last moments at Amma’s Ashram. We had breakfast in the western cafe and chatted with two Danish girls who were also heading to Varkala today, but by train. Our drive to Varkala took two hours but luckily I saw shotgun with the driver with the A/C and great views of the countryside. I was very happy to see our homestay, Kaiya House. It is run by Debra, an American, who has lived in Kerlala for about 4 years. Kaiya House was very luxurious, especially when compared to the ashram. Hot showers, queen size beds and wi-fi made me internally squeal with glee. 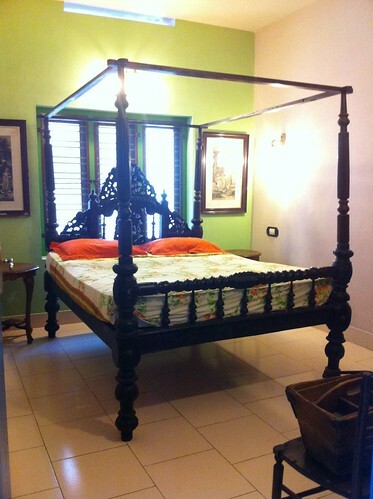 The bedrooms are themed and after showing us the Japanese, African and English rooms I chose the English room for my one night in Varkala. 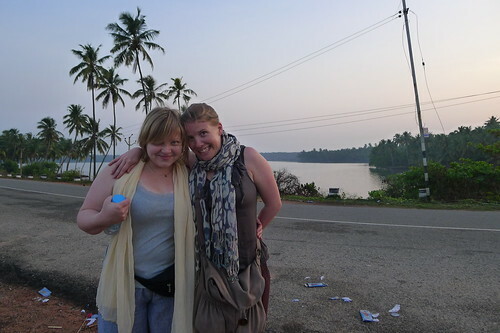 Debra gave us a tour of Varkala, which was above and beyond our expectations. 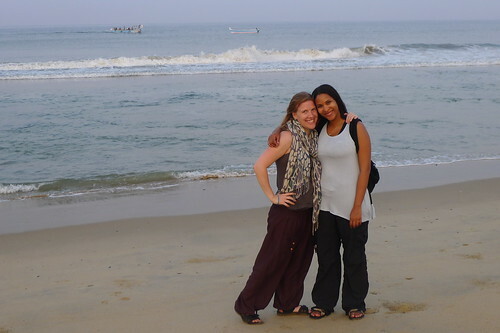 It was really great getting her take on Varkala and South India. She showed us her favorite eating and shopping spots and most importantly how to get to the beach. We had lunch with a view of the Arabian Sea at a beachside restaurant run by Tibetans. Felt like I was truly on vacation looking out at the sea eating my lunch. Suze and I took a dip in the Arabian late in the afternoon. The surf was a bit rough here too. The water was nice and warm and perfect for wading and having a good splash. We lounged and read on the beach after swimming til sunset then walked back to Kaiya House to get cleaned up for dinner. Just as we were leaving it started to rain torrentially. This rain storm seemed epic as we had a birds eye view from the rooftop. With lots of thunder, wind and lightining eventually the power went out so we watched and talked by candle and iPhone light. I enjoyed nature’s light show and shared a bottle of red wine with Debra while Suze and Ana had Rum and Coke with her husband. We eventually made it back to the cliffs by the beach for dinner after the storm died down. I was tipsy at this point but remember a great meal with great conversation and great friends. It was my last night with Suze and Ana so we talked about the last few days and other trips and places we’d like to visit. The next morning we were up bright and early for a sunrise walk along the beach, suggested by Debra. 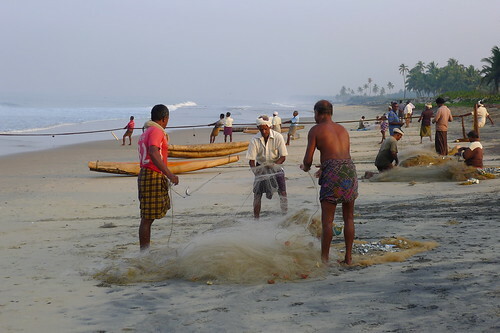 It was so worth getting up at 430AM to watch the sunrise and the local fisherman bringing in the nets and sorting their catch. 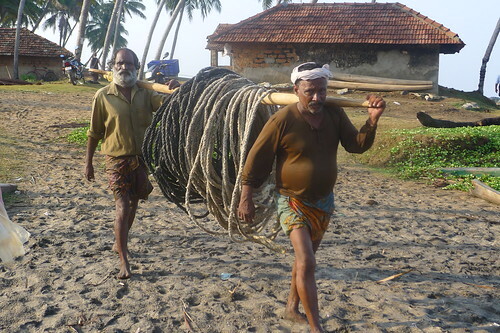 Many thanks to Debra and family for making my short stay in Varkala spectacular. I look forward to spending more time there in the future.